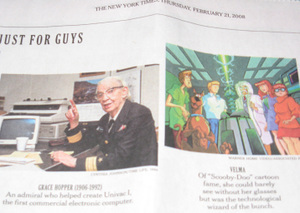 Grace Hopper Listed in the NYT next to VELMA from SCOOBY DOO? First they listed Augusta Ada Byron and the amazing GRACE HOPPER, then… well – what could be pictured after Grace Hopper – but VELMA of the Scooby Doo cartoon ("technological wizard of the bunch"). I was a COBOL programmer for years but first heard about Grace Hopper from Sylvia Paull (who organizes the Berkeley Cybersalons and also founded Gracenet) at a BlogHer holiday party. When I told Sylvia that I started my career programming COBOL – she told me that a WOMAN invented it (Grace Hopper). I was so proud. Grace Hopper, the original "girl geek" is celebrated yearly at the Women in Computing conference. RU Sirius discussed how the word "girl nerd" turned to "girl geek" while interviewing a resource for all things girl geek: Annalee Newitz and Charlie Anders who wrote the book She’s Such a Geek: Women Write About Science, Technology, and Other Nerdy Stuff" and have a blog "Shes such a geek". That book lists even more girl geeks … Oh – I happened to also have the honor of briefly meeting Annalee Newitz at that same BlogHer Holiday party (BlogHer = Great Networking). In lieu of a proper listing in the NYT article (no offense to Velma), I decided I would provide links to amazing girl geeks and women in technology of the past and present. Parents, here is a real taste of girl geek chic to show your girls (and boys)…UPDATE 6/13/08 TO ADD TWO WOMEN THAT ARE HELPING EXPLAIN THE WEB 2.0 REVOLUTION AND SOCIAL MEDIA WITH THEIR TWO BOOKS: Charlene Li with her book "Groundswell" and Sarah Lacy with her book "Once You’re Lucky, Twice You’re Good". Inspiring women mentioned on the Girl Geeks legends web page including Ada Byron (creator of first computer program), Evelyn Granville (computer programmer NASA), Grace Hopper (Creator of Cobol), Marjorie Lee Browne (Doctor of Mathematics) and women in internet, tech/finance, software, hardware, and a few more girls to add to the next generation. CNET UK reminded me to add Marie Curie, but many questioned why Paris Hilton was on that list. At the last Girl Geek dinner I had the opportunity to hear speakers Irene Au (Director of User Experience, Google), Rashmi Sinha (CEO, SlideShare) and Katherine Barr (moderator – Partner, Mohr Davidow Ventures) along with two nextgen gals under 30 but already kicking arse – Leah Culver (Lead Developer & Co-Founder, Pownce), Sumaya Kazi (Entrepreneur & Social Media Manager, Sun Microsystems) and event organizer Angie Chang (Co-Founder Women 2.0). The Facebook Garage Girl Geek Dinner was another event that showcased the "girl geek" talent out there..
Kara Swisher (top of my list of innovators with her "BoomTown" column on my favorite blog "All Things Digital") recommended two females for the 2nd in line spot at Facebook: Joanne K. Bradford and Joanna Shields. She’s Geeky is an organization that brings together whip smart girl geeks including Charlene Li, Web 2.0 research guru. Their organizers should also be listed. Add to that BlogHer Co-Founders Lisa Stone, Jory Des Jardins, Elisa Camahort along with Women Tech Innovators at Google, Susan Decker and the Women Execs at Yahoo, Meg Whitman and other Fortune’s most powerful women. How about Mena Trott from Sixapart and Caterina Fake from Flickr? Or Sarah Lacy, Deborah Schultz, Emily Chang, Elise Bauer, Tara Hunt, Lena West, Lynne d Johnson, Kerry Miller or Carmen Van Kerckhoveof Anti-Racist Parent or Susan Getgood? Better yet just watch the video tech news by Forbes reporter Kym McNicholas that covers topics from discussing how Google Earth is used for California fire monitoring or talking with fellow tech inspiration Charlene Li about embracing the groundswell. Katie Couric is another tech innovator that has made the move online with the Couric & Co blog and uses social media such as YouTube to get the word out on her causes. Here is a link to a YouTube video about colon cancer awareness. Nelly Yusupova has an interesting article about being a influencer in technology aimed at women "We need to change the geek stereotype and start showcasing that geek girls are the hip and cool people in society". –Check out the women listed in the MIT Young Innovators under 35. Or the winners of the Stevie Awards in the category for recognizing women for their innovative use of technology in growing their businesses. Women’s Voices. Women Vote site has links to women’s voices. And there are many more…. order to honor Dr. Borg. Prior to founding the Institute, in 1987 Dr. Borg founded Systers, the first online community for women in computing." Silicon Valley Moms Blog, DC Metro Moms Blog, New York City Moms Blog, 50-Something Moms Blog, New Jersey Moms Blog, New York City Moms Blog, Deep South Moms Blog, Chicago Moms Blog and LA Moms Blog. All the moms in the Techmamas TwitterMoms Group! Pamela Hornik – Blogs About Her Favorite Things.. Please comment with more links to girl geeks! Filed Under: Blogging, Learning Opportunities, Social Networking, Virtual Inspiration, Women in Tech Rule! You are so right — you’ve listed some wonderful role models for our daughters! I remember seeing Grace Hopper many years ago as an interviewee on “60 Minutes.” At the time, I knew nothing about computers — but she was impressive as hell and I never forgot her. It would be nice to locate that interview. Okay so I recognize like 4 of these names and 3 of them are the BlogHer founders. Good thing I came here…so I can now sound smart in front of the next Girl Geek I run into at a cocktail party. It was a great article. I loved that when I worked for a dot com I could program HTML. Then when I started my blog, I kept telling people I edited my own CSS (even though it almost ruined my marriage). Power to the geeks! So it’s not too late to aspire to be a girl geek? ?